The winning proposal arises from the dramatic event of L’Aquila earthquake, focusing on S.Eusanio Forconese recontruction in Abruzzo, Italy . 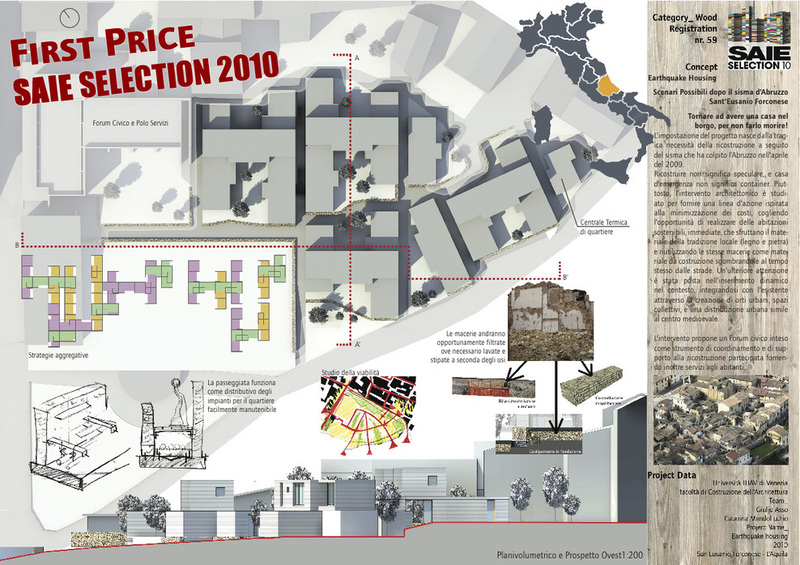 The Earthquake Housing & Multipurpose Centre won the SAIE Selection Contest 2010. Among the jury there was Mario Cucinella, an Italian architect famous for his insights on sustainability. The exhibition and workshop was held in Bologna, Italy during a major construction and building technologies fair. The project suggests an alternative way to re-think about reconstruction after an earthquake. The hurry for a cheap building doesn’t help in the long period and prefab houses just address the urgency of money and time saving. On the contrary, the planning stage should pay attention to the human resources, the natural resources, the sustainable aspect and the cultural area of the tragedy. For that reason the project focuses on two main aspects: building a service center, as a base for the operations after the emergency, and wooden prefab houses as homes for displaced persons. 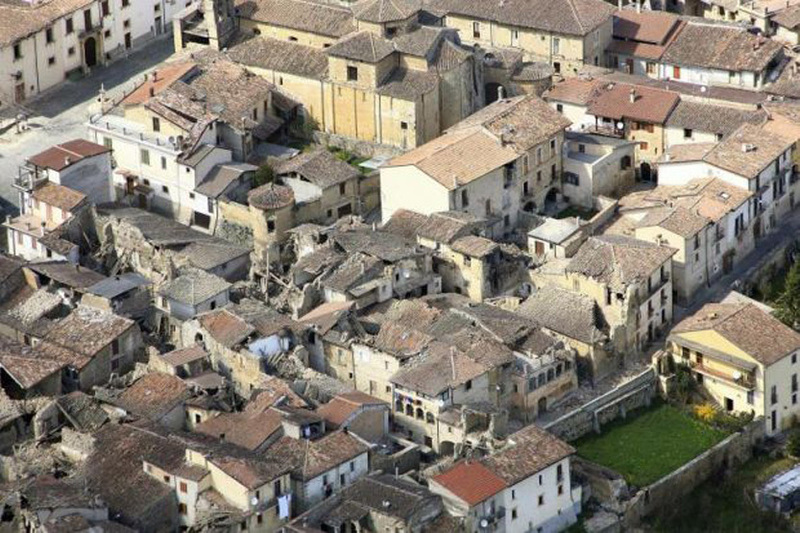 Both are studied for a specific village, S.Eusanio Forconese and a specific site within the village. Special attention is given to the debris problem. After the earthquake, most of the village now lies in a pile of rubble. Instead of carry the debris elsewhere, they are used as part of the project: the aim is to cut the costs by putting them in metal-wire gabions and use them as retaining wall or as part of the existing walls. Further more, after filtering and washing, they can help to create a earthquake-proof foundation. Chance to configure the units with modules The houses are build up like “menus”. During the first scenario is it possible for the people to choose how to configure their home. The modules are then easy to build and upgrade, even adding a new room. The idea was to use the debris instead of dispose of them, reducing the time and cost of transportation, dividing them directly on the site after collecting from the village. Intact stones will be used to fix existing walls, and to rebuild the collapsed houses. Broken stones and small debris will be used in the gabions as retain wall in front of the embankment.